It’s high time we updated you on Mapumental, our journey-time mapping project. For those who may not remember, Mapumental is based on a simple idea: to visualise transit times, by public transport, from or to any postcode in Great Britain. It all began in 2006, when the Department for Transport approached us to see what we might do with public transport data; in 2009 we won an investment loan from Channel 4 and Screen West Midlands which enabled us to build a beta tool – you might have played with it. If not, go on, have a go. It’s fun! It’s been quite a long journey to where we are today. Unlike many mySociety projects, funding for Mapumental’s development came from a commercial investment loan, with a condition that we set it up as a business. For that reason, it’s not enough that it’s beautiful and useful – we need to find ways for it to be profitable, too. All revenues are set to come back to fund our not-for-profit activities. We could tell from very early on in the project that Mapumental would be a sought-after tool for all sorts of purposes, from business to personal use. For example, you can see commute times at a glance, so it’s great for house-hunters and job-seekers. Consequently, it’s also great for the property and recruitment industries. We can see loads of other possibilities too – like urban planning. This sort of analysis would have been far more expensive in the past; with Mapumental, planners can see at a glance how accessible a new development would be by public transport. Its potential uses are wide-ranging, answering questions for businesses, organisations, charities, and public facilities – especially those wanting to maximise accessibility or encourage use of greener transport options. We’ve recently refined a product that’s pared down from the dynamic maps you may remember from that beta tool: static maps. 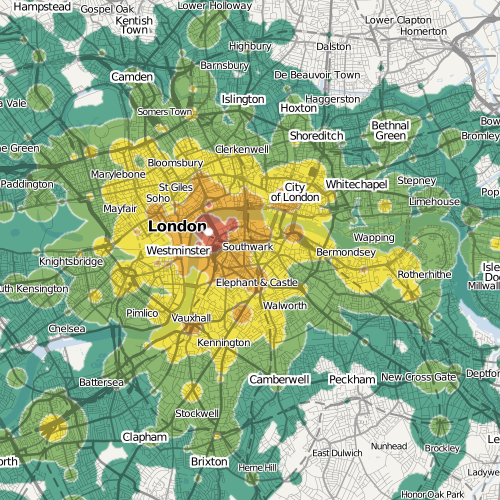 These are simple, non-interactive maps which show transit time in bands. They’re flexible in that they can be generated for any postcode, with any maximum travel time, and depict travel at any given time of day. We can provide a one-off map for personal use, or batches of many thousands of maps – as we have done for estate agents Foxtons, who now have a Mapumental map on every property listing. As we generate more and more maps for different uses, showing different parts of the country, we’re really enjoying digging out all sorts of surprising facts – like how it’s quicker to travel from Watford to Westminster than it is from some parts of Harringay. Or how Cardiff University students might sensibly live at all points east as far as Newport, but will be stymied for transport in the west if they live anywhere other than Barry or Bridgend. In fact, our very favourite use so far has come from an individual who centred his map around his home postcode. He tells us he has printed it off and put it up by the front door, so that on his way out of the house, he can find a new and surprising destination for day-trips. Find out more on the Mapumental website – and please do spread the word among friends and colleagues who might benefit from a Mapumental map. That looks lovely, Richard! Thanks for sharing.